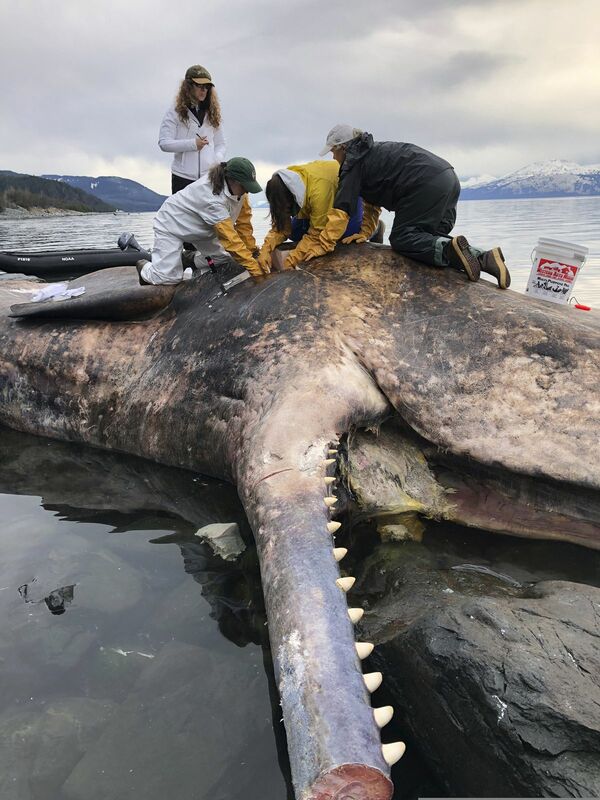 JUNEAU — As soon as she walked up to the whale, Kate Savage could tell how it died. There were three deep, long parallel slices just in front of the sperm whale's dorsal fin. Savage, a veterinarian for the National Oceanic and Atmospheric Administration, knew that meant a propeller had sliced into the great mammal. "It was pretty unexpected, and very exciting," Savage said in a phone interview Friday. Sperm whales are rare in the Inside Passage, but Savage said there were reports in November and early March of sperm whales in the Inside Passage. It's not clear if this whale was one of the ones sighted earlier, she said. They were particularly interested in the leviathan's stomach, to see if it contained concerning amounts of plastic or large amounts of sablefish. Increased amounts of plastic in the ocean have been killing sea creatures, and sperm whales have gained a somewhat notorious image for preying on sablefish in large numbers, Savage said. They didn't find plastic or sablefish in the stomach, Savage said, but they found numerous squid beaks. Members of the team were pleased to not find any plastic. Many fishermen have reported seeing magister armhook squid in Lynn Canal, according to the NOAA article. Other intriguing finds, Savage said, included a large area of globular fat attached to the sternum and bumpy areas in the animal's skull in places they didn't expect to find them. They've now sent samples they took to sperm whale experts to get their thoughts on the find. Savage admitted that with so few sperm whales up here to examine, she and the other researchers weren't quite sure what was rare and what was normal. "It really is going to be a good way to extend our knowledge, our personal knowledge of sperm whales and sperm whale anatomy and what to expect next time," Savage said. "Who knows when that will be? But at least we'll be prepared." The second time the researchers came back, about a week later, they found that someone had come and stolen the whale's jaw. Sperm whale teeth, Savage said, are coveted. Raiding a sperm whale's body is also illegal, as the animal is endangered. 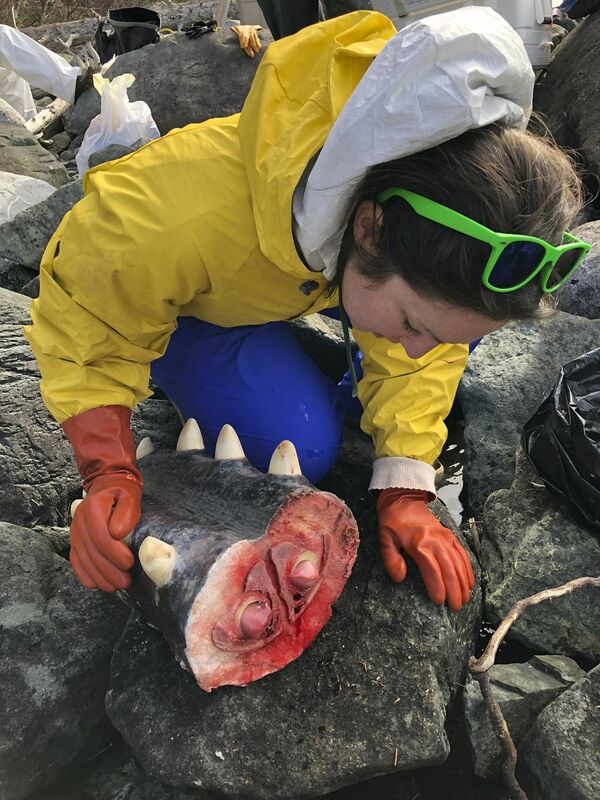 NOAA encourages the person who took the jaw to return it, and anyone who has knowledge of who might have taken it are asked to call the NOAA Office of Law Enforcement's 24-hour hotline at (800) 853-1964 or the Alaska Division at (907) 586-9329.